Thank you Rhea for the flame! The Flame of Friendship. A symbol of spirit of unity.The burning icon of love.Undying picture of hope.The hot symbol of oneness. 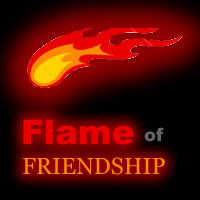 The Flame of Friendship. And now it's your turn to pass on the flame! I'm now passing the flame to abelle and jan.